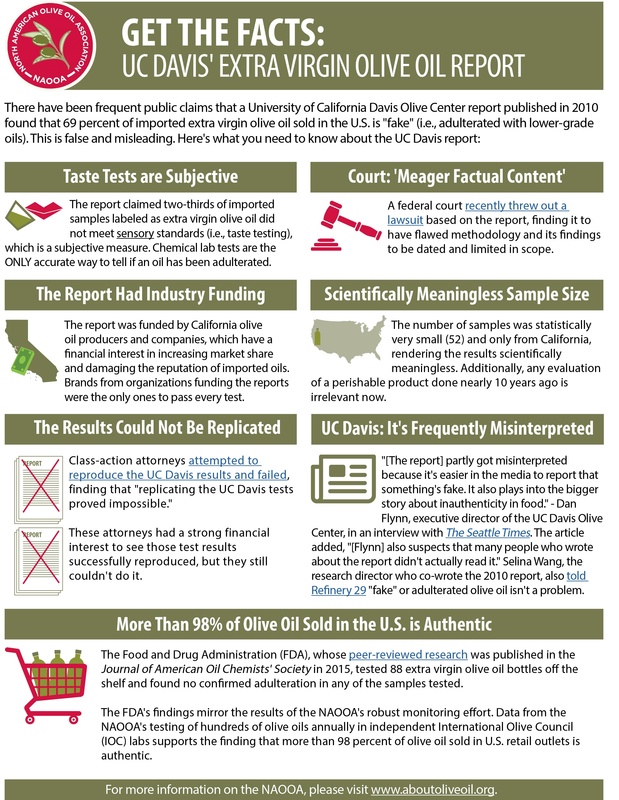 Many false stories are circulating around the internet about olive oil fraud citing a report prepared by the University of California Davis Olive Center. These stories often list some well-known olive oil brands and claim that the oils are adulterated. In fact, the UC Davis Olive Center report did not find any adulteration or cutting of olive oils with either seed, nut or vegetable oils. 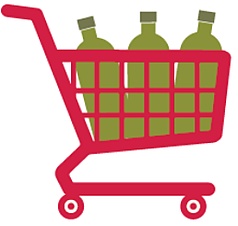 Attempts to use the report to spread stories of olive oil fraud are misleading. Read more below. The report claimed two-thirds of imported samples labeled as extra virgin olive oil did not meet sensory standards (i.e., taste testing) which is a subjective measure. Chemical lab tests are the ONLY accurate way to tell if an oil has been adulterated. A federal court recently threw out a lawsuit based on the report, finding it to have flawed methodology and its findings to be dated and limited in scope. oil producers and companies, which have a financial interest in increasing market share and damaging the reputation of imported oils. Brands from organizations funding the reports were the only ones to pass every test. The number of samples was statistically very small (52) and only from California, rendering the results scientifically meaningless. Additionally, any evaluation of a perishable product done nearly 10 years ago is irrelevant now. Class-action attorneys attempted to reproduce the UC Davis results and failed, finding that "replicating the UC Davis tests proved impossible." These attorneys had a strong financial interest to see those test results successfully reproduced, but they still couldn't do it. "[The report] partly got misinterpreted because it's easier in the media to report that something's fake. It also plays into the bigger story about inauthenticity in food." - Dan Flynn, executive director of the UC Davis Olive Center, in an interview with The Seattle Times. The article added, "[Flynn] also suspects that many people who wrote about the report didn't actually read it." Selina Wang, the research director who co-wrote the 2010 report, also told Refinery 29 "fake" or adulterated olive oil isn't a problem. The Food and Drug Administration (FDA), whose peer-reviewed research was published in the Journal of American Oil Chemists' Society in 2015, tested 88 extra virgin olive oil bottles off the shelf and found no confirmed adulteration in any of the samples tested. The FDA's findings mirror the results of the NAOOA's robust monitoring effort. Data from the NAOOA's testing of hundreds of olive oils annually in independent International Olive Council (IOC) labs supports the finding that more than 98 percent of olive oil sold in U.S. retail outlets is authentic. To download a JPG version of this page, click here.